For over 145 years we have drawn from our experience and expertise in flooring and floor maintenance equipment to create a premier line of Resinous/Epoxy Floor Coatings. Our vast collection of standard colors and finishes, and almost unlimited number of custom colors allow you to create attractive floors that work in your environment. Tennant provides comprehensive tools for professionals including specifications, performance data, design details and more. 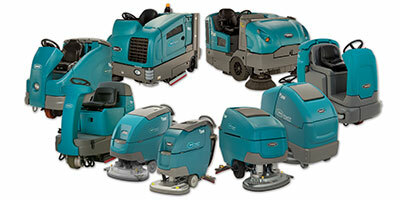 Choose the Tennant Cleaning Equipment that's right for maintaining your floors. Tennant Company designs and manufactures indoor and outdoor coatings systems for a variety of applications. Sort by your industry to learn more about achieving superior results with Tennant Coatings. Choose a coatings system that is specific to your application from a variety of colors and designs in epoxy, urethane and MMA coating systems. Learn about the wide range of products available to transform your space, from repair, to refinishing and maintenance. Tennant is an industry leader in flooring experience, knowledge, and expertise. Part of that leadership has come from creating durable, high performance concrete floor coatings that, together with Tennant cleaning equipment, create the widest range of solutions to meet virtually any flooring need. Tennant Coatings, a leader in aviation and aerospace resinous flooring, offers a wide variety of systems to fit your facility needs. Make a lasting impression with Tennant’s Static Dissipative system, Eco-SDS™ with a satin finish. Eco-SDS™ Satin stands up to high traffic areas while helping keep your avionics and personnel safe from unwanted buildup of static electricity. Tennant Company designs, manufactures, and markets a wide variety of floor cleaning machines for both indoor and outdoor cleaning. Find a scrubber, sweeper, extractor, vacuum, burnisher, floor machine, outdoor green machine, air sweeper, sweeper-scrubber, all-surface cleaner, or other Tennant cleaning equipment to fit your environment.